Fishing is a fun and healthy activity for everyone, and we want to keep it that way! Before heading out to wet a line, please take the time to read through the safety tips below. Always check the latest forecast before you go on the water. Visit the Bureau of Meteorology's marine weather forecast. Check water and weather conditions before you go. Always tell friends or family of your plans – where you are going and when you will be returning. Never fish alone – always fish with a friend. Wear a personal flotation device and carry safety gear and a first-aid kit. Wear appropriate clothing with non-slip soles. Watch the water at all times as conditions can change dramatically in a short time. Have a great day fishing and tight lines! Wear appropriate footwear with non-slip soles. Wear light clothing that will allow you to swim easily if you are washed in. Don't wear waders when rock or ledge fishing. Seek out local advice on your intended fishing spot – tidal behaviour and accessibility. Observe first and fish later. Take time to judge your intended spot before fishing to get an idea of tidal and sea conditions plus access and escape routes. Always obey danger signs and never trust access and escape aids such as ropes and makeshift steps. Have an escape plan. If the swell threatens your position, leave immediately. Never turn your back on the sea. Watch the sea at all times as conditions can change dramatically in a short time. The Victorian Government’s Play it Safe by the Water campaign is actively working towards increasing community awareness of water safety. For further information, click here. We recommend that all boat-based anglers read the Victorian Recreational Boating Safety Handbook before they hit the water. 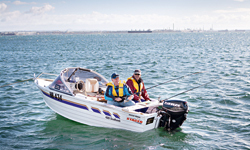 The Victorian Recreational Boating Safety Handbook can be downloaded here. Check the weather forecasts. Consider postponing your trip if the weather is unfavourable and avoid areas exposed to high wind and waves. Ensure your boat is properly maintained, the battery is fully charged and you have enough fuel on board. Seek up-to-date local knowledge and obtain a copy of the appropriate chart or map for the area you will be navigating. Always let someone know where you are going and when you plan to return. Ensure you have the correct safety equipment aboard your boat and you know how to wear it correctly. Don’t drink alcohol while boating. Operate at a safe speed and always maintain a good lookout. Always wear a lifejacket. It is mandatory to wear a lifejacket in Port Phillip Heads. 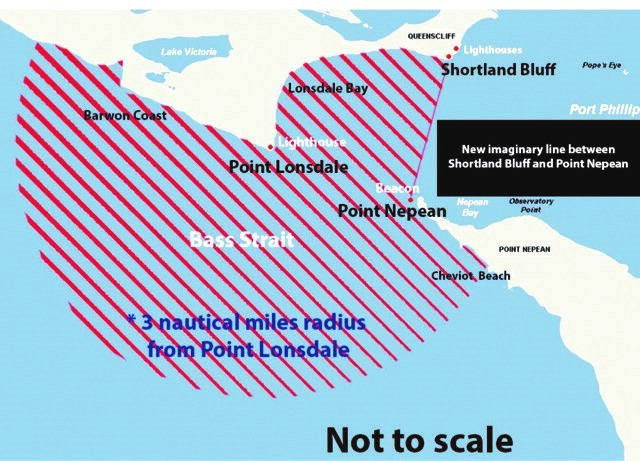 Port Phillip Heads means all the waters between an imaginary line drawn between Shortland Bluff and Point Nepean, and the seaward limits of an imaginary line consisting of the arc of a circle with a radius of 3 nautical miles centred on Point Lonsdale. The area shaded in red on the map on page 92 marks where it is mandatory to wear a lifejacket. Click here for more information on boating safety or call 1800 223 022 for a copy of the Victorian Recreational Boating Safety Handbook. Port Phillip Heads is a major shipping channel, dive location and popular fishing destination. It’s also home to Marine National Parks and Sanctuaries where no fishing can take place. The best way to avoid Marine National Parks and Sanctuaries is to use the ‘Can I Fish Here’ function on our app. Download our Vic Fishing app via the App Store or Google Play.